Learning that football is a numbers game was a moment that changed the way I thought about football and how I approached football gaming. It made the game feel less random and that I had more control over the outcome. I first heard this from a site called Smartfootball.com. Before learning this my play-calling was very random and I never had a real thought process as to why and when to call a run play versus a pass play. The general premise is if the defense has two safeties you run the ball, and if they have one you pass. 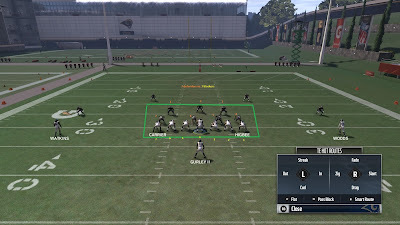 The reason this concept works is when running the ball ideally you want to have a blocker for every player in the box. If this happens there should be no player who is close to the line of scrimmage free to tackle the ball carrier before he gets well past the line. Now what does the defense do when the back is running for big gains through the defense? They bring a safety down and get the numerical advantage back on their side. Now there are more defenders then the linemen can block. With an unblocked defender close to the line of scrimmage ready to hit the running back for a short gain the general strategy is to pass. Note: There are exceptions to this rule which will be discussed in later posts.